Recently, I've been finding myself on Pinterest and online looking at an old familiar quilt block but looking very modern. This block goes by many different names, Churn Dash, Hole in the Barn Door and Monkey Wrench are the 3 names that come to mind, but there could be more! I picked up some great coordinating fabrics from ConnectingThreads.com that were these gorgeous colours that reminded me of salt-water taffy. 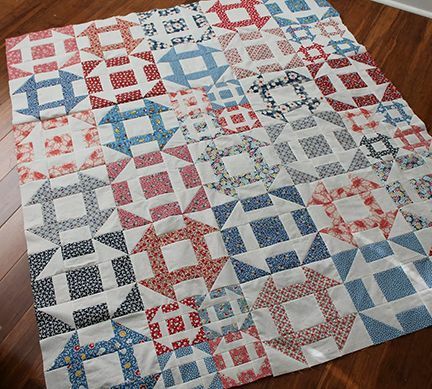 I wanted to do this quilt top without any sashing and vary the blocks, so some most had a white background and some had the colour and white reversed. 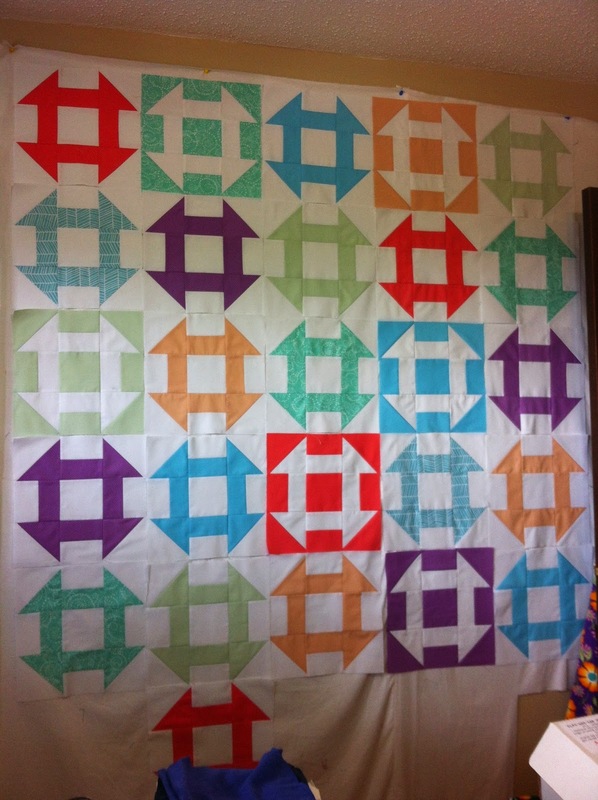 This was my inspiration (found on Pinterest, link is lost, but the original comment on Pinterest says it was from Cynthia Brunz's blog "Quilting is More Fun than Housework) I love how she included both large and smaller blocks! 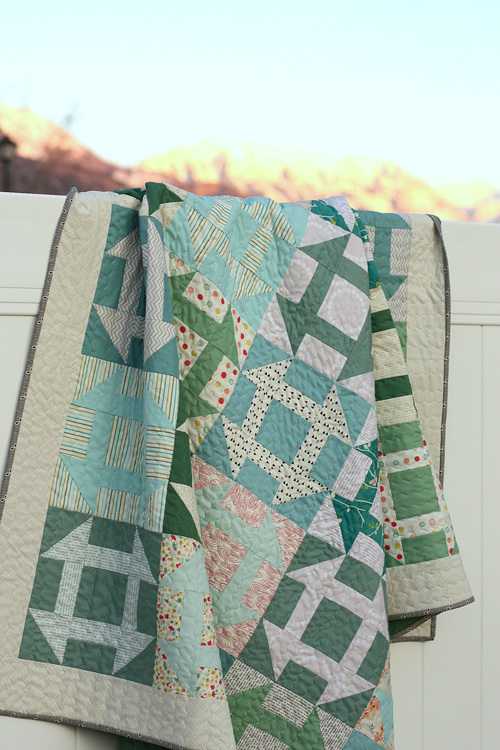 and this one from "We All Sew", a site from Bernina that provides projects of all kinds and a great tutorial for this quilt.:http://weallsew.com. This one stood out to me because of the cool blues and greens, and the mixed backgrounds. To prep for this quilt, I sorted my fabrics, and found a few from my stash that had the same density of colour that were in the purchased fabrics and I cut enough pieces to make 3-4 blocks of each colour. These were then put into a pizza project box and when I didn't have anything else on the go, these were the blocks I worked on. At some point, instead of being a "between project" piece, these quilt blocks and colours began to grow on me and demanded they become a main project. I put them up on the design wall as they were completed and just love the way they look together! 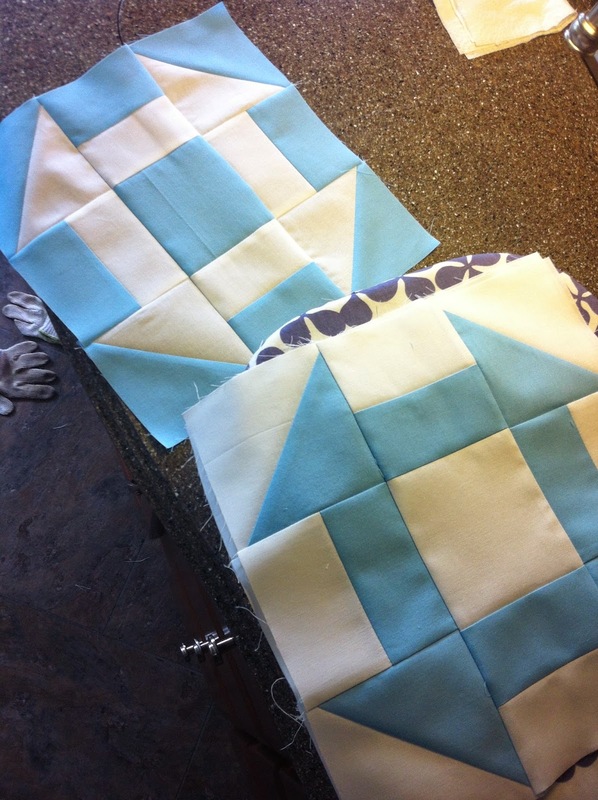 Without sashing to separate the blocks, it took a little longer, (well, a lot longer), to sew the blocks together into a top that is ready for quilting! Now I just need to piece a backing fabric and this one is off to be quilted by Marie of Blueberry Hill Quilts in Chestermere, Alberta. What's your fav traditional block? Have you seen it sewn up so it looks modern?